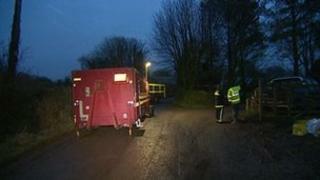 A £200,000 fire engine has been destroyed by burning diesel during a blaze at a farm in Devon. The fuel escaped from a ruptured tank during the fire in Collaton Lane in Tavistock early on Sunday. The burning diesel ran down the lane and ended up underneath a fire engine parked about 20m away, fire crews said. The fire engine was abandoned as unsafe, although crews were able to move two other fire engines. Six people living near the blaze were evacuated. Firefighters were called to the farm buildings just after 01:00 GMT. Two neighbouring homes were evacuated and a 200m exclusion zone was put in place amid fears there are acetylene cylinders inside the buildings. Firefighters expect the exclusion zone to remain in place for the rest of the day. Area commander Steve Widnell said: "The severity of the fire caused one of the tanks inside the building to rupture. "A flow of burning diesel went down the lane and the appliance was in its path. "Two other appliances were removed but it was too dangerous to move the first one and we took the decision to evacuate the scene rather than risk some of our firefighters." Investigations into both fires have started.